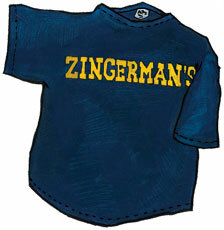 Zingerman's t-shirt for sale. Buy online at Zingerman's Mail Order. Gourmet Gifts. Food Gifts. Show everyone you know food (and fashion) with this t-shirt. What says Ann Arbor better than a dark blue shirt silk screened with our iconic design in block letter print? Nothing comes to mind. Whether you're a fan of reuben sandwiches, large football stadiums, or the small Midwestern college town where you can find both this t-shirt has you covered. Show your pride or give a little bit of Ann Arbor to an ex-townie that misses home. Fits like a t-shirt. Not too tight, not too baggy. Made from 100% cotton.